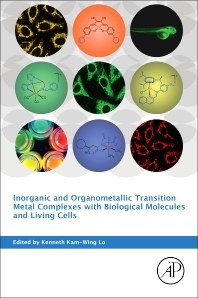 Inorganic and Organometallic Transition Metal Complexes with Biological Molecules and Living Cells provides a complete overview of this important research area that is perfect for both newcomers and expert researchers in the field. Through concise chapters written and edited by esteemed experts, this book brings together a comprehensive treatment of the area previously only available through scattered, lengthy review articles in the literature. Advanced topics of research are covered, with particular focus on recent advances in the biological applications of transition metal complexes, including inorganic medicine, enzyme inhibitors, antiparasital agents, and biological imaging reagents. Professor Kenneth Lo obtained his PhD degree in 1997 at The University of Hong Kong. His PhD work centered on the design of luminescent transition metal complexes as DNA and metal-ion probes; and the photophysical and photochemical studies of luminescent polynuclear coinage metal chalcogenide complexes. From 1997 to 1999, he worked as a Croucher Foundation Postdoctoral Research Fellow in the Inorganic Chemistry Laboratory, University of Oxford. He carried out research work on genetic engineering and electrochemistry of cytochrome P450cam and putidaredoxin. Professor Lo joined the Department of Biology and Chemistry of City University of Hong Kong as Assistant Professor in 1999 and became Associate Professor (Scale B) in 2003, Associate Professor (Scale A) in 2007, and Professor in 2011. Professor Lo’s research interest is the utilization of luminescent inorganic and organometallic transition metal complexes as biomolecular and cellular probes, with a focus on the development of intracellular sensors, photoactive labels, and bioimaging reagents. He received The APA Prize for Young Scientist from the Asian and Oceanian Photochemistry Association in 2005 and the Distinguished Lectureship Award from the Chemical Society of Japan in 2011. He is currently on the Editorial Advisory Board of Inorganic Chemistry and is an Associate Editor of RSC Advances. He isone of the Vice Chairs of the Gordon Research Conference Metals in Medicine 2016. He was awarded a Croucher Senior Research Fellowship (2015 – 2016) from the Croucher Foundation.